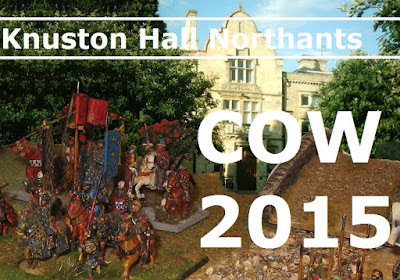 My COW started immediately after the Eleanor Cross ceremonies with an attempt to identify enemy vehicles from a command post (we did OK but got no special commendations or promotions) - but the first session I presented was after breakfast on Saturday morning. 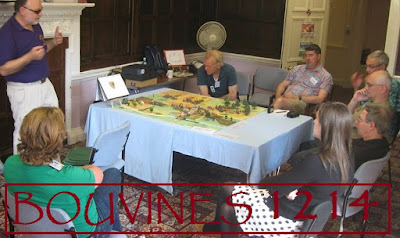 This was a session marrying the Bouvines talk I had given at the June NBS meeting with the game I ran at WMMS. 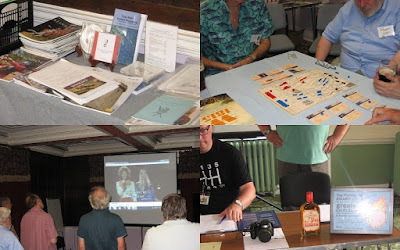 We had just about half the session on the history and half the session on the wargame. 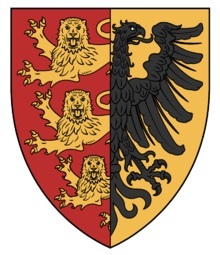 This is, of course, dimidiated, the arms of England and the arms of the Empire. It symbolises France's Western enemies and her Eastern enemies in one person. Otto was descended directly from Henry the Lion of Saxony and Henry II of England - he was Richard's nephew and protégée and was brought up at the English court before winning the Imperial crown for himself. He was a career enemy of the King of France. 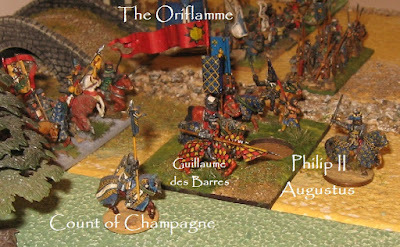 Otto's allied army included the count of Flanders and his low country vassals, so we can include France's Northern enemies in the mix. Indeed, France was surrounded and the allies planned to squeeze the life out of her. 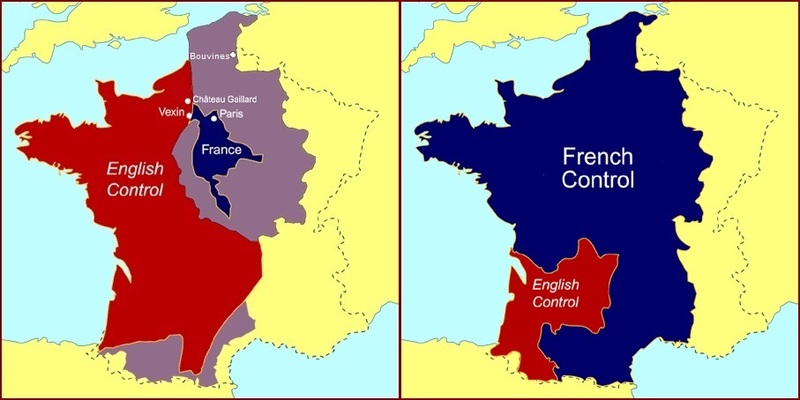 Not only are we looking at the collapse of the Angevin Empire and a massive expansion of the authority of the King of France ... we are looking at the geographical realisation of what we can call modern France. 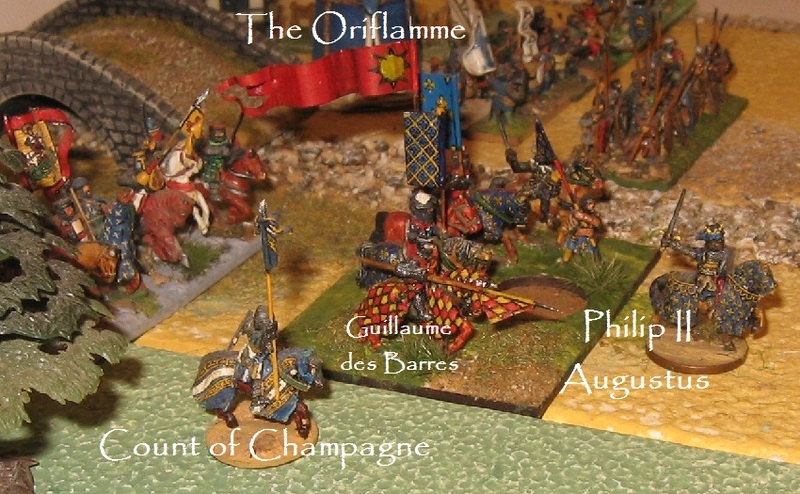 Responding to Otto's invasion, King Philip headed North East via Lille to Tournai, crossing the small river Marque at Bouvines - but realising it had all but 'missed' the enemy (and might be committed to fighting in less than ideal terrain), he ordered his army about and fell back on Lille via the crossing (intending to establish his forces further North and in good cavalry country). 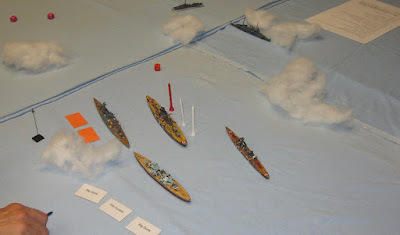 The allies realised what was happening and, despite it meaning battle on a Sunday, sent a flying column under the Count of Flanders to catch the French before they had completed their crossing. 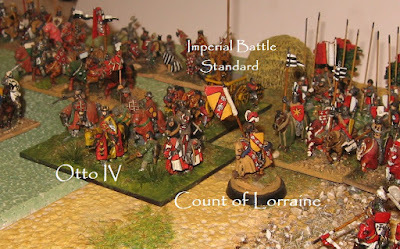 Meanwhile Otto would make a steadier approach via Tournai and expected to find the French in disarray when he arrived in support of the fixing attack. 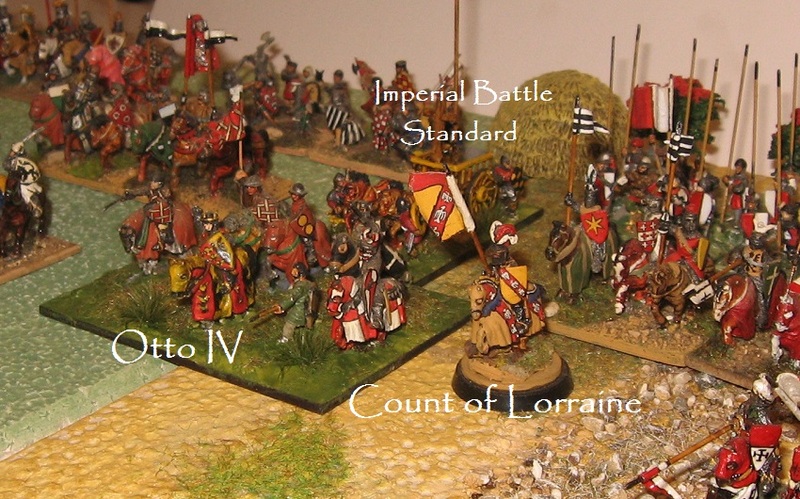 In fact, probably due the shrewd actions of Philp's advisor, the Crusader veteran bishop Guerin of Senlis, the French had marched with a strong rearguard which was able to repel the repeated attacks of the count of Flanders while key elements the main army were called back and deployed for battle. 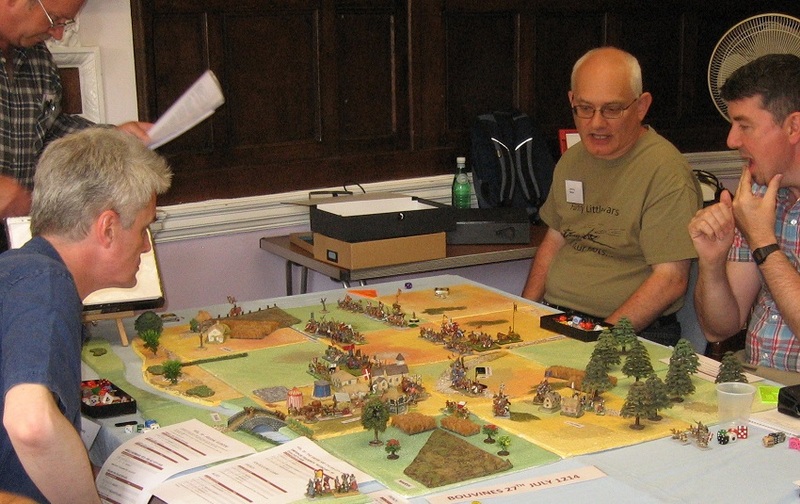 So, it was the allies who arrived piecemeal - and found the French arrayed in good order and on favourable ground. 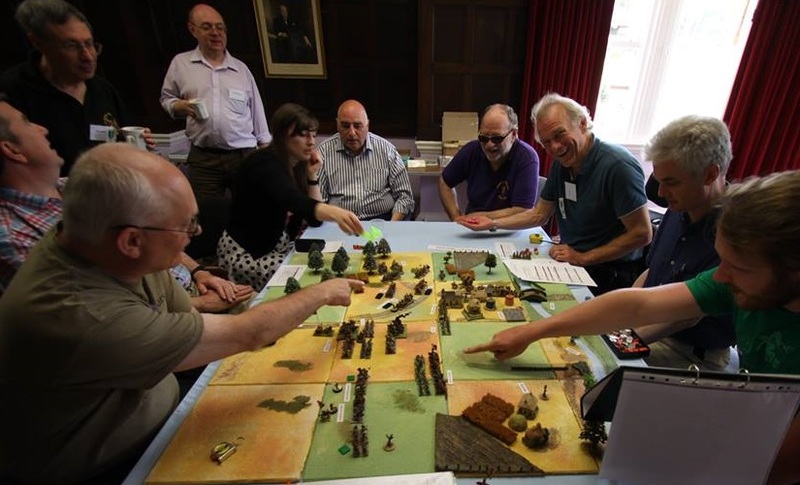 The battle was decided by the mounted nobility of both sides in a fierce battle of charge and countercharge ... so I opted to recreate it with modified Basic Impetus. The figures are 15mm from my Feudal collections (a wide range of manufacturers) with some special pieces added to represent the commanders and their prominent battle standards. 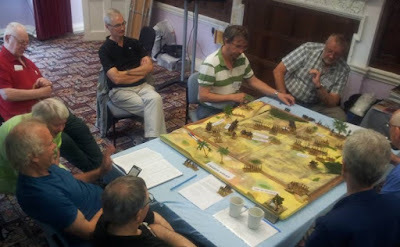 In our game, the battle went much more to the allied plan ... repeated attack under the count of Flanders pushing the French rearguard back into the outskirts of the village by the end of the afternoon. We ended up with something like an honourable stalemate in favour of the allies. Of course this is substantially different to the historical outcome and the most favourable to the allies of the refights I have staged. It certainly does vindicate the allied plan - but also perhaps vindicates Verbruggen's suggestion that after their forced march to the battlefield and the disordering effects of filing up the road, the Flemish knights may not have been in the best condition for battle (and I had not so handicapped them). Historically, although most of Otto's leaders were captured, he escaped - but within months was deposed by Frederick II who restored the Hohenstauffens. 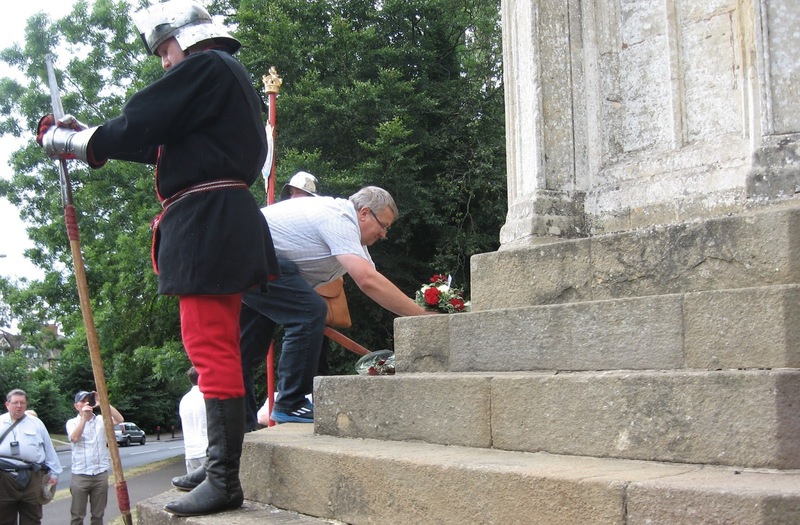 And so, as well as defining Anglo-French history, the battle at Bouvines changed the course of history in central Europe and the Mediterranean. I had a good number for this session, and they seemed to enjoy the mix of history and game play. My own contribution to the After Dinner phase was a 5 player participation game of Sink the Bismarck using some simple new rules I have been working on and the old Airfix 1:1200 set of waterline battleships. 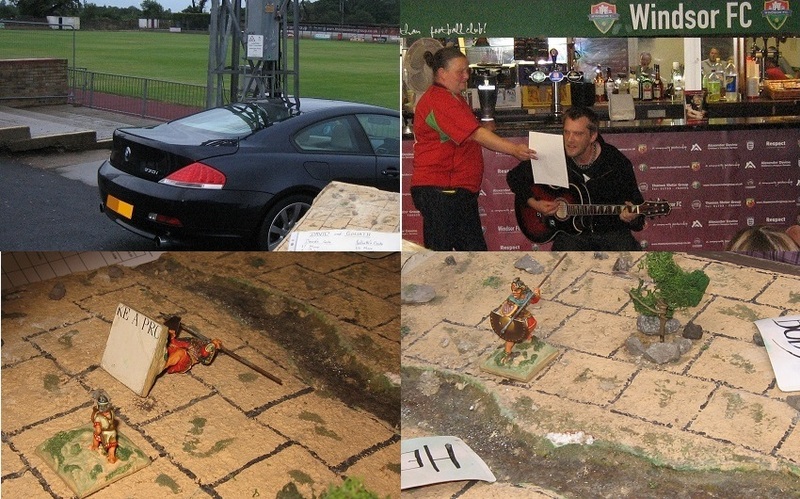 That's all for another blog - but watch out for some good stuff if you like simple rules. We wound the evening up with a few games of the innovative W1815 quickfire boardgame, a Waterloo anniversary singalong and some late games of David and Goliath in memory of the inimitable Andy Gittins. 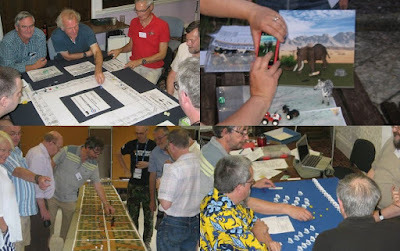 Sunday morning I was back on station, presenting a wargame approach to ancient and medieval history ... 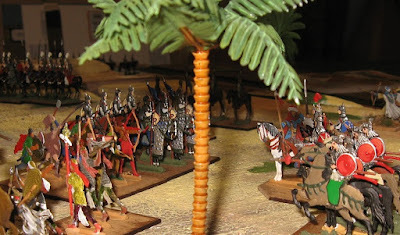 Some of you will already have seen my Yarmuk project which combines Phil Barker's oldest figures with his newest game in an exploration of one of the pivotal battles of Islamic history. I was very pleased that Phil and Sue were able to attend this session, and I hope they enjoyed seeing the old figures in action. 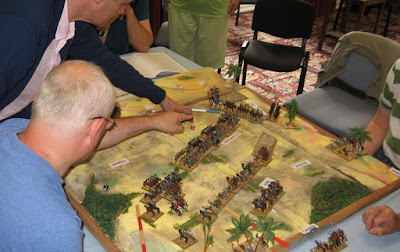 They suggested I take on these old figures (Phil's first ancients, which he painted to play ancients with Tony Bath) when he saw my Lords of the Nile project which featured refurbished flats from the Deryck Guyler collection (though the majority were by Tony, not Deryck). Yarmuk was a huge battle East of Damascus where the largest army Eastern Rome could muster was drawn forward into a protracted battle of envelopment by a much smaller Arab force under Khalid ibn Al Waleed. 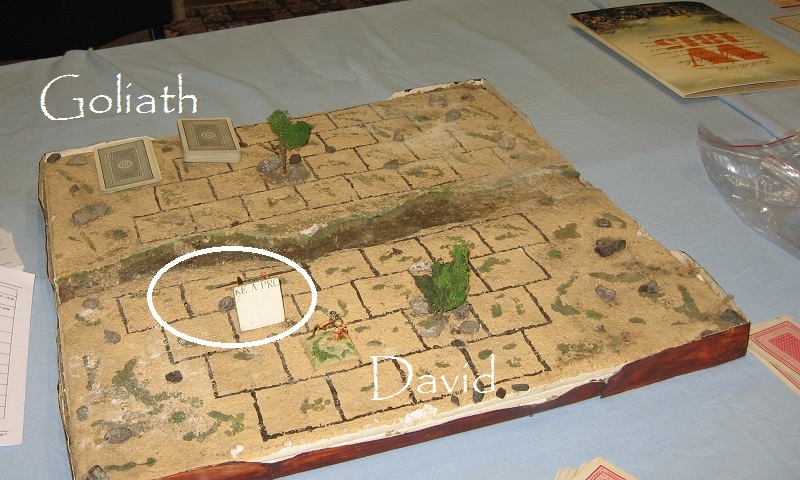 It is another little known battle which changed world history. 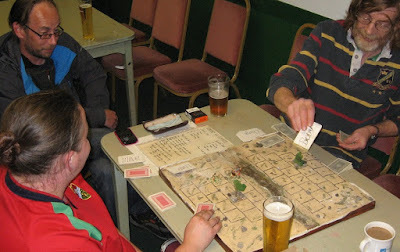 In the version of the game we played, some striking early die rolls were cancelled out and all commands in the game suffered losses. 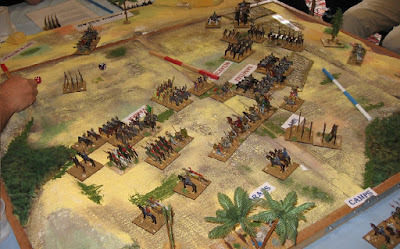 Eventually Vahan broke Amr's main line while Khalid broke Quanateer's left flank setting up something like the historical final day showdown. 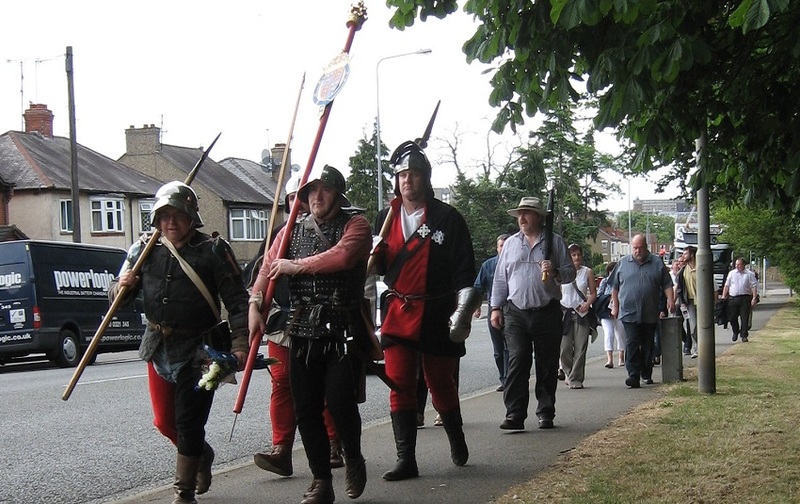 In fact, something of a rarity, we decided to leave the battle at that point as coffee and biscuits were being served in the hall and honours were about even. Also a rarity, the majority of players were new - or relatively new - to DBA ... needless to say, they were playing freely within a few turns: Phil and Sue were able to enjoy the action while I just had to help with the combat maths and keep the players on the turn sequence. We acknowledged the Society's 50th birthday, Andy's parting, played DBA and Gladiolus and sold some Society games. 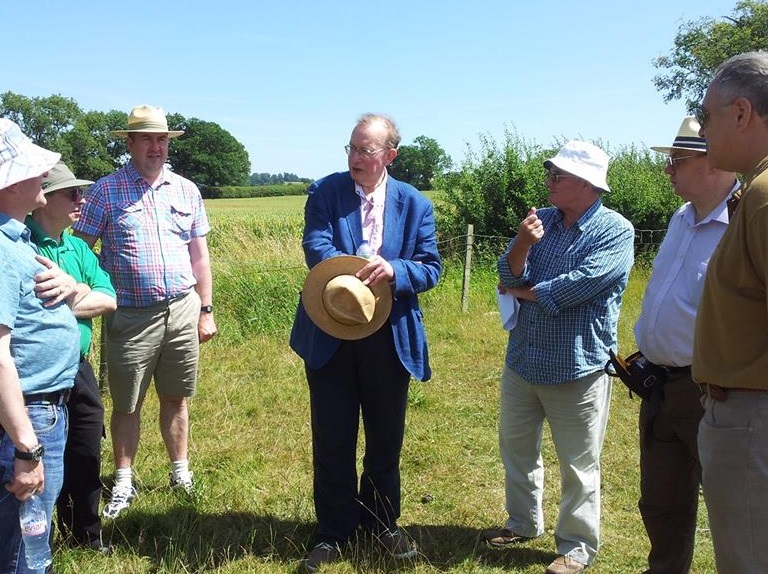 Edgcote battle was fought in July 1469 near the crossing of the river Cherwell between the forces of Edward IV and his former champion, Warwick the Kingmaker. 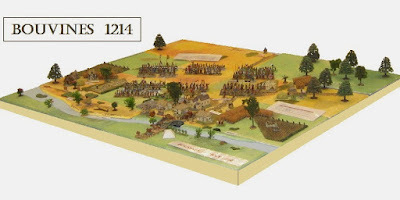 The sources leave us with a number of uncertainties over the position and orientation of the battle. 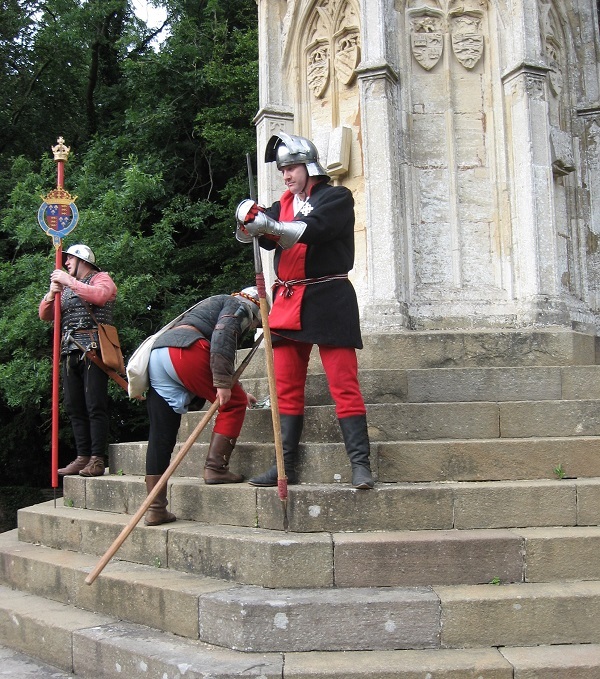 The Royalist leader, the Earl of Pembroke, was taken the following day to Northampton where he was executed at the Eleanor Cross, site of Warwick's earlier victory. Delayed in Peterborough, I managed to catch up with some of the WD party at the end of the visit. ... and then marched along with local politicians and historians behind members of the Harrington's Companye to the Eleanor Cross - from which the archbishop of Canterbury and the Papal legate watched the battle in 1460. Although I did duck out on Saturday lunchtime for an opening at Kettering Art Gallery, I spent the rest of the weekend at Knuston Hall for the Conference of Wargamers ... before leaving Northamptonshire for Windsor for Andy's last do. 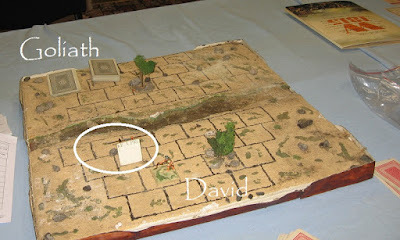 We listened to celebrations poetic, personal and musical and played some games of Andy's SoA classic David & Goliath. 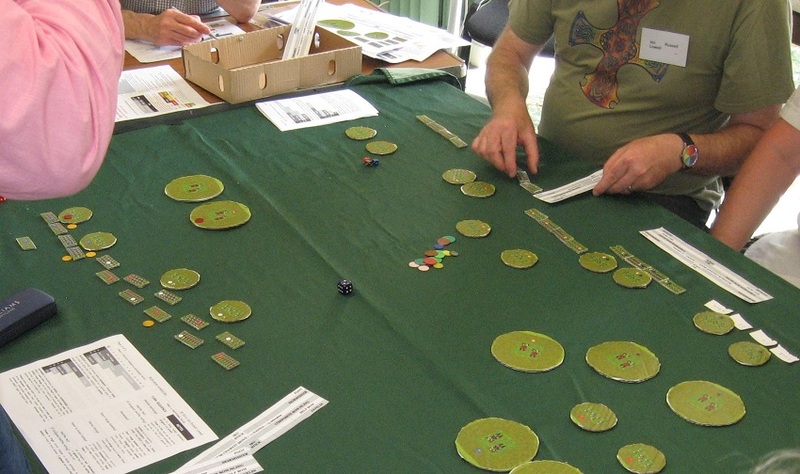 I now have a set of cards and rules for the Alexander's Empire game and am hoping to put together a retrospective of Andy's work as a game designer.